Have you changed your e-mail address, moved house or welcomed a new addition to your family? Keep us up-to-date. Here's where you can easily edit your personal details. Please type in your IKEA FAMILY membership number and your date of birth for identification purposes. Please fill in all the fields marked * and pay attention to upper/lower case! Enter the last 12 digits without any spaces. I would like to receive offers, news, vouchers and gifts from IKEA by e-mail, post or text message. You can enter your children up to the age of 15 in your IKEA FAMILY profile. From the age of 16, we welcome your child to our IKEA FAMILY. The IKEA FAMILY customer survey – help us make IKEA even better! The IKEA FAMILY customer survey is our chance to find out from you how you rate the quality of the IKEA products you have bought. to take part in our customer survey, you need an e-mail address. If you have signed up for the survey, you'll receive an e-mail with a link to your very own online questionnaire around two weeks after your next purchase from IKEA (it is especially important that you show your IKEA FAMILY card when you pay). It doesn't take long to answer the questions about the products you have bought. And you can of course opt out of the survey again at any time. We collect personal data in order to offer you better services: for example, optimizing our stores, matching our products to customer needs or personalizing customer communication and offers. In this way you can find out about things that you are interested in and receive less advertising in total. By collecting personal data we can also simplify purchasing or customer services processes so that you get where you want to be faster. IKEA AG, Müslistrasse 16, CH – 8957 Spreitenbach, with Company ID no. : CHE 106.081.670, is responsible for the collection and processing of your personal data in Switzerland. We collect and process personal data in many different situations and for a variety of purposes. When you visit our web pages or stores, buy our products in a store or in our Online Shop, contact our customer service, or communicate with us using any of the available channels we collect information to improve our service to you. We also obtain data from third parties. In all cases, data obtained from external providers is treated with the same care and security as any other personal data we handle. If you choose to withhold any personal data requested by us, it may not be possible for you to gain access to all sections of the IKEA website, enjoy the advantages of IKEA Family and for us to respond to your queries or provide services to you. The data we collect depends on what data is required to be able to provide a specific service. For example, we need name, address, payment information and other contact details to be able to deliver a product purchased in our Online Shop. Name and contact details – full name, home address, delivery address, invoice address, phone numbers, email address. Demographic data – date of birth, gender, size of your household, language preference. Membership information – IKEA FAMILY membership number, IKEA Business Card number. Payment information – credit card and bank information. Device and device usage information – session data from visits to our websites apps for mobile devices or services on Internet platforms, multimedia portals and social networks, including visit duration and frequency, language and country settings, information on your browser and computer operating system, internet protocol addresses. Location information – location data from the use of mobile devices. Customer activities – contract information, record of purchases, record of buying habits, customer service information and all information transmitted when contacting customer service, including voice recordings. Photos and video – Photos and video recordings of visits to our stores. We retain your personal data for as long as we consider necessary or appropriate in order to comply with valid legislation, or as long as it is necessary for the purposes for which it was collected. We delete your personal data as soon as it is no longer needed. We use the personal data that you have provided us with or the personal data we have collected, to provide you with the best possible service and shopping experience when searching for or buying a product or contacting customer service. We also use the data to analyse customer behaviour to optimize our stores, Online Shop, marketing material and activities. For all types of processing we make sure to define a clear purpose and to establish a legal basis for the processing of your data. To be able to handle and administer your purchase of a product(s) The purchase agreement constitutes the legal basis for processing your personal data. To be able to fulfil our legal obligations we need to be able to process personal details such as name and address to fulfil a delivery. To manage your membership in IKEA FAMILY and IKEA BUSINESS, and for the safe and accurate handling of personal data linked to your IKEA FAMILY and IKEA BUSINESS membership The agreement we have entered into with you (i.e. our commitment in the IKEA FAMILY and the IKEA BUSINESS Customer Relationship Agreement) constitute the legal basis for managing your membership agreement. The processing is necessary in order for us to comply with our contractual obligations. To be able to provide customer services IKEA has a legitimate interest in processing your personal data as that is necessary to assist you when you have questions or complaints about our products or services. This may also include follow-up questions and surveys about products and services. If your question concerns a complaint, we will process your personal data in order to fulfil our obligations under applicable laws and based on the scope of our agreement with you. 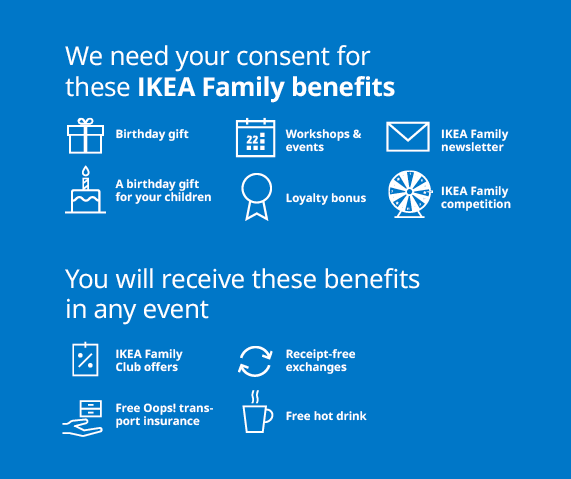 To be able to send general marketing material (such as mailing our catalogue or other offers or information) and personal direct marketing via email, SMS, surface mail, social media or to provide IKEA Family advantages such as presents and complimentary vouchers The agreement we have concluded with you (i.e. our commitment in the IKEA FAMILY and the IKEA BUSINESS Customer Relationship Agreement) constitutes the legal basis for processing your personal data. The processing is necessary in order for us to comply with our contractual obligations to you, such as provide you with products or services that we think you may be interested in. If you are an IKEA customer but not a member of IKEA FAMILY or IKEA BUSINESS, IKEA will process your personal data to send marketing material based on our legitimate interest in being able to market IKEA products and services. To be able to administer your participation in competitions and events It is our legitimate interest to be able to administer and follow up competitions and events, such as confirmation of participation, questions to participants or information about winners. To be able to update and improve services and products as well as the technical functionality of our computer systems It is our legitimate interest to be able to make updates to the technology that allows you to visit our website, use our mobile applications or shop in our web shop or to understand how you as a customer experience our products and thereby improve existing and develop new products and services. To be able to prevent unauthorized use of our services It is our legitimate interest to provide secure services and prevent attempts to unauthorized access or improper use of our services. To be able to register persons who report that they do not want unsolicited marketing from IKEA Justifiable and legitimate interest at the individual’s own request, not to receive any marketing material. In order to fulfil IKEA’s legal obligations, such as product safety, decisions from authorities, accounting or tax requirements To be able to fulfil our legal obligations, such as product safety, decisions from authorities, accounting, tax or other requirements. Cookies enable us to recognise your web browser. This is useful because then you don’t need to repeatedly input your data, specify choices, put products in your shopping basket, or modify your settings. It also means we can improve the performance of our website and better understand visitor behaviour on our website, and other parties can learn about your surfing behaviour so that they can show personalised advertisements across several websites and omit non-relevant advertisements. Which cookies do we use, and how? Most of the cookies we use are automatically deleted by your computer or mobile device at the end of the browser session. We also use permanent cookies, which are stored on your computer or mobile device after your browser session ends. At your next visit to our website your preferred inputs and settings are then automatically recognized. These cookies are automatically deactivated after a pre-set expiry time. They are used to make our website more user-friendly, effective and secure. Thanks to these cookies, for example, the site displays information specifically matched with your interests. The retargeting technology that we use enables us to address advertising to those users who have taken an interest in our Online Shop and our products in the past. We are convinced that displaying advertising that is personalized and matched with the individual’s interests is more interesting to the user than advertising that lacks any such personal connection. Retargeting displays advertising on the basis of a cookie-based analysis of the user’s previous behaviour. We cooperate with partner companies on this, and accordingly our partner companies’ cookies may also be stored on your computer or mobile device when you visit our website. These cookies are automatically deactivated after the programmed time expires. The cookies that we use do not store any personal data and cannot be attributed to any particular individual. When a cookie is activated, it is assigned with an identification number. Most Internet browsers accept cookies automatically. But you can use the settings to instruct your browser not to accept cookies, or to ask you each time before a cookie is accepted from a website visited by you. You can also delete cookies from your computer or mobile device by using your browser’s corresponding function. If you decide to deactivate our cookies or those of our partner companies, you will not see certain information on our website or be able to use some functions designed to improve your visit. How we use Adobe Analytics for web analyses? At our request, Adobe uses the information obtained from the cookies to analyse your use of our website and prepare reports on website activities. These reports are made available to us for analytical purposes. Adobe may pass this information on to third parties if this is a statutory requirement or if they process the data on Adobe’s behalf. Under no circumstances will Adobe link your IP address to other data they store. You can prevent the installation and storage of cookies by setting your browser software accordingly. We would point out, however, that you will then no longer see certain information on our website, and you will no longer be able to use some functions designed to improve and simplify your visit. Web analytics is the collection, gathering, and analysis of data about the behaviour of visitors to websites and apps. A web analysis service collects, inter alia, data about the website from which a person has come (the so-called referrer), which sub-pages were visited, or how often and for what duration a sub-page was viewed. Web analytics are mainly used for the optimization of a website and in order to provide you a better online experience. Google Analytics uses Performance Cookies, which are stored on your computer and allow an analysis of the use of the website. The information generated by the cookie about your use of this website is usually transmitted to and stored by Google on a server in the United States. The IP address provided by Google Analytics as part of your browser will not be merged with other data provided by Google. This website uses Google Analytics with the extension „_anonymizeIp ()“ to anonymize the IP address of the user. The IP anonymization takes place as soon as data is received by the Google Analytics collection network, before any storage or processing takes place. How do we use social plug-ins? Recommendation buttons for the Facebook, Google+ and Twitter social networks are available on our website. By using these you can recommend selected website content to other users of the social networks and add them to your personal profile. The recommendation buttons are provided by the social network operators. By placing these plug-ins on our website these social network operators may receive the information that you have visited our website. If you are logged onto one of these networks during your visit to our website, its operator can attribute this visit to your user account. If you do not want this to happen, we recommend logging out of social networks before visiting our website. In a number of cases we provide your data to external parties. However, we will never sell your data to a third party. When we work with external companies that provide services where they need to process personal data, they may only use your data for the purposes that IKEA specify. They may not, therefore, use this data for their own purposes or transfer the data to others. It is also possible that we are required by law to disclose your data to government bodies or other parties. In all cases we will only disclose what is strictly necessary by law. We can pass on your personal data to other IKEA companies for the purposes set out in this data protection policy. These companies can then use your personal data in their own interest for the same purposes as we do. In particular, IKEA companies can process your personal data for individualized, personalized analyses of customer behaviour and for direct marketing activities in their own interests. IKEA employees are given access to your personal data only to the extent necessary for the performance of their professional duties. If a service provider is located in countries where applicable legislation does not provide protection of personal data comparable with Swiss law, IKEA will always require the service provider to fulfil the rules and obligations set out in Swiss law. Finally we can pass on your personal data if we consider this necessary to be compliant with valid laws and regulations, in connection with legal proceedings, at the request of responsible courts and authorities or under other legal obligations, in order to protect and defend our rights and property. We are taking appropriate technical and organizational measures to protect the confidentiality and integrity of your personal data. We protect your personal data from unauthorized or accidental destruction, accidental loss, technical errors, falsification, theft or unlawful use, and also from unauthorized amendment, copying, access or other unauthorized processing. You should be aware, however, that the transmission of information via the Internet and other electronic media creates certain security risks, and that we can give no guarantee of the safety of information transmitted to us by these means. You have the right to request a copy of the information that we hold about you. If you would like a copy of some or all of your personal information, please contact us using the contact information below. If any piece of information is incorrect, we will make an update at your request. You can also ask us to delete your data and not to use it again. If you have given your permission for the use of your information, you can withdraw that permission. However we may be required to store data for which you revoked your permission. Please be aware that deleting your data may limit our ability to provide you with services related to our products, e.g. proof of warranty. If you feel that we have processed your personal information incorrectly, you can always contact us at IKEA. The Federal Data Protection and Information Commissioner (‚FDPIC‘) is responsible for law enforcement and supervision related to data protection in Switzerland and complaints can also be submitted to them. Contact details for FDPIC are available here or by phone +41 (0)58 462 43 95. • By contacting IKEA customer service via our contact form or by phone 0848 801 100 (max. CHF 0.08/minute from a landline). From time to time, at our own discretion and without prior warning, we may update, amend, supplement or otherwise revise this data protection statement, as a result of which your personal data previously collected by us may be processed in a significantly different way. 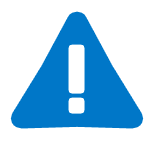 We recommend that you regularly check whether our data protection statement has been updated. Please check your details to make sure they are correct. Thanks. You will now be sent a confirmation e-mail to complete your registration. We will take over your new data and of course we will keep you up to date. Unfortunately, we couldn't identify you as an IKEA FAMILY member. Unfortunately, an error occurred when transferring your data.